Aqualea is the eighth level boss in the VS COM mode of the Super Nintendo Entertainment System version of Wario's Woods. She is a mermaid with a pink tail and blue hair. Aqualea also has fins covering her gills where ears would be on a human. Aqualea is very bitter, vain, and overconfident in her own abilities; she also believes that she is irresistible and that her competitors lose just to be able to face her again. 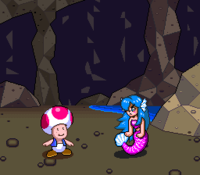 Despite this, Aqualea calls her opponent Toad overconfident as a result of his previous victories. Aqualea bears a strong resemblance to Mad, another mermaid boss from the Nintendo Entertainment System version of Wario's Woods. Aqualea after losing to Toad. Aqualea after victory against Toad. This page was last edited on January 14, 2019, at 13:28.